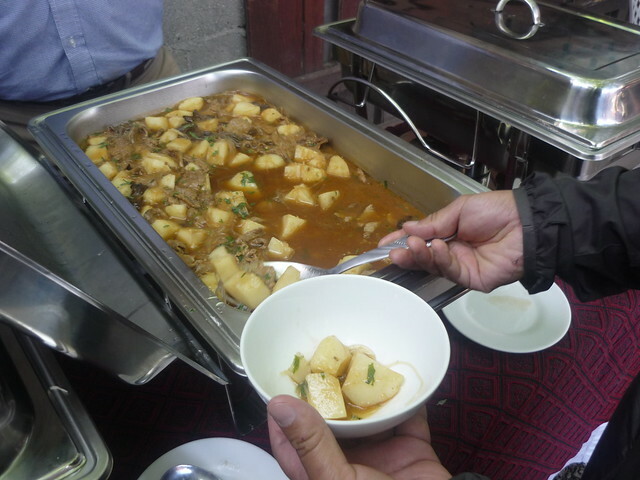 Posted by elzilcho in Musical Performances, Public event, Tibetan art, Tibetan Arts and Culture, Tibetan Food. 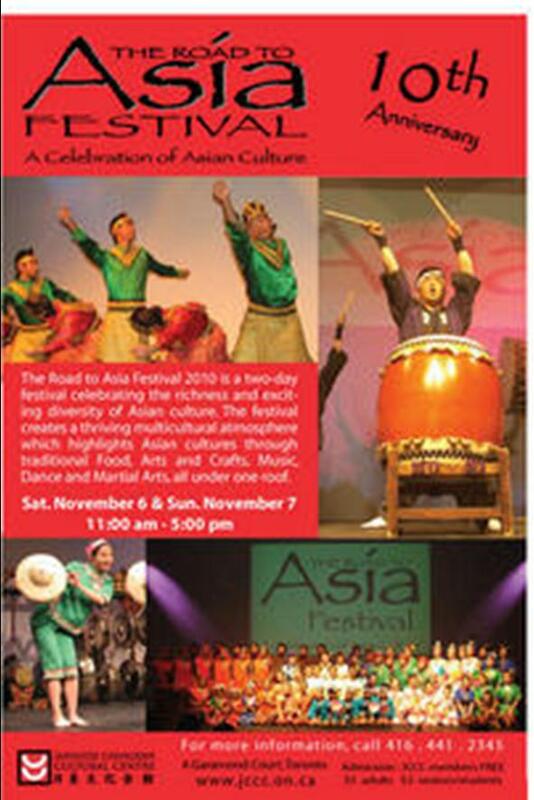 DreBu is excited to participate in this year’s Road to Asia festival at the Japanese Canadian Cultural Centre. The Road to Asia Festival 2010 is a two-day festival celebrating the richness and exciting diversity of Asian culture, all under one roof. The festival creates a thriving multicultural atmosphere in which individual cultures are highlighted through their traditional Food, Arts and Crafts, Music, Dance and Martial Arts. Last year’s festival created a rich mix of the cultures of 9 different Asian nations and was visited by approximately 3,000 people. We are hoping to see all of our previous participants returning this year including Myanmar, Thailand, Philippines, Indonesia, Pakistan, China, India, Tibet, Taiwan, and, of course, Japan. We hope to celebrate this fantastic milestone with more of everything that makes The Road to Asia Festival so much fun. Each ticket admits two and can be used for either Saturday or Sunday. 1. Tibet Kitchen 1544 Queen St. W.
Note: Those who live far from Parkdale can email us for free electronic passes. Copyrights 2009-2011 DreBu. All rights reserved. Copyrights 2009 – 2011 DreBu. All rights reserved. 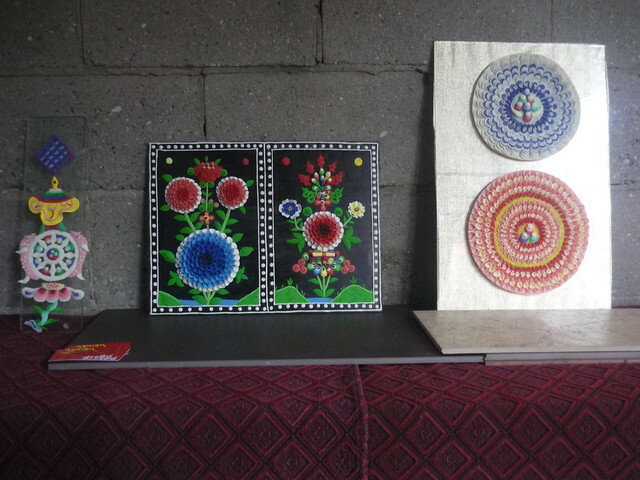 Posted by elzilcho in Public event, Tibetan art, Tibetan Arts and Culture. Drebu successfully launched its “Tibet in Film” series with the exclusive screening of “the Search” by famed Tibetan director Pema Tseden. 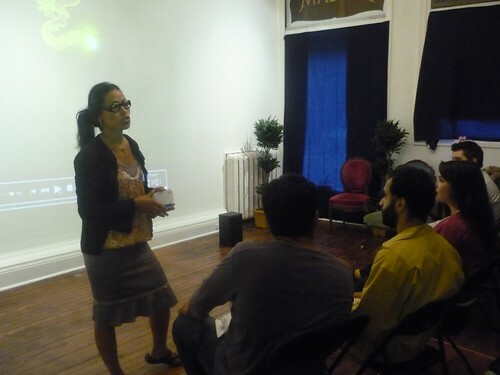 Held in the Mascot Cafe in Parkdale, the screening was attended by nearly 30 people. 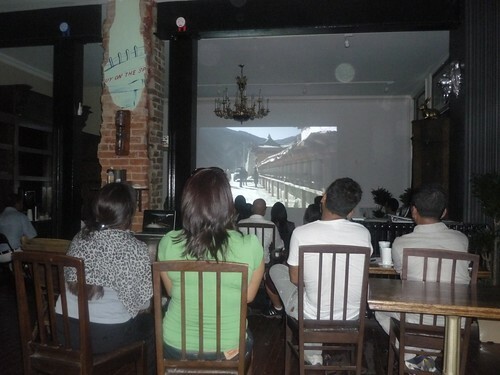 It was the first time that the cafe was hosting a film screening. 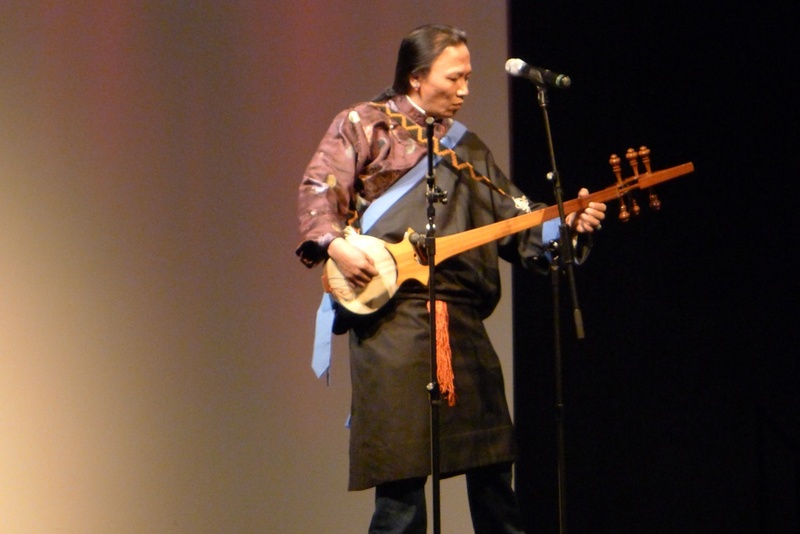 The screening kicked off with a live musical performance by Tseten la, a traditional Tibetan musician. With his strong instrument, he played two songs from the region that was the backdrop of the film. 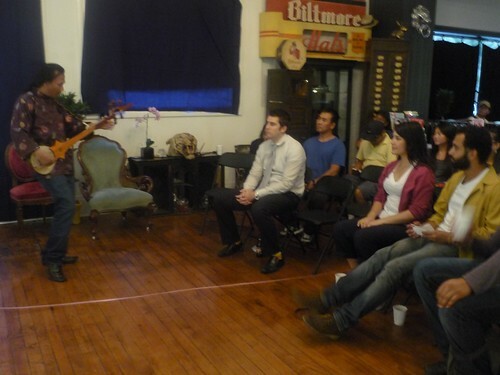 “It was a great event,” remarked Eddie, one of the three owners of this new cafe/art space, at the end. Earlier in the evening, Eddie was asked to share a few thoughts before the start of the screening, where he mentioned that helping Drebu by donating their space was one of the ways in which they wanted to give back to the community. “We want to create a space for beautiful things to grow, and we hope this is one of the ways by which we can accomplish that,” he said. The movie was well-received by the audience. Owing to the art-house style and deliberate pace of the film, along with the screening location, many of the attendants felt that it was a unique experience. For some, this was the first time they had been exposed to Tibet and Tibetan works of art. The money raised from this pay-what-you-can screening will help with the upcoming Culture Days event on Sunday, Sept. 26. 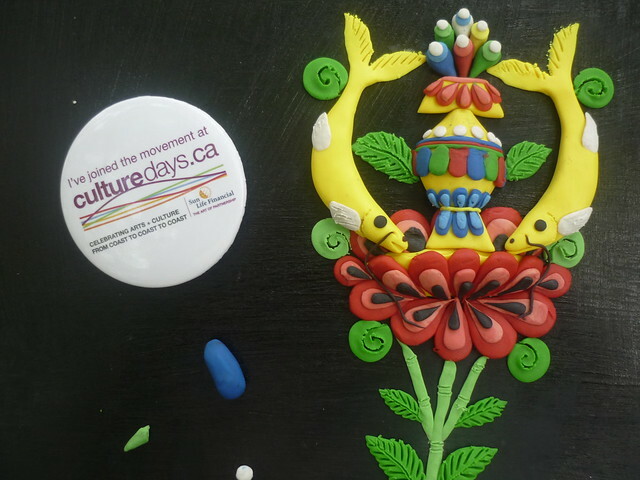 The event will feature a live butter sculpture demonstration, Tibetan music and food (courtesy of Tibet Kitchen). 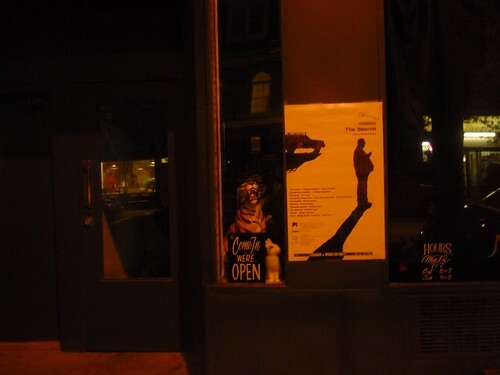 Drebu would like to thank Pema Tseden for blessing us with the screening of his film, the Mascot Cafe for donating space and drinks, Tibet Kitchen for donating the food, our volunteers, and all the participants who came to the screening and generously donated their time and money. 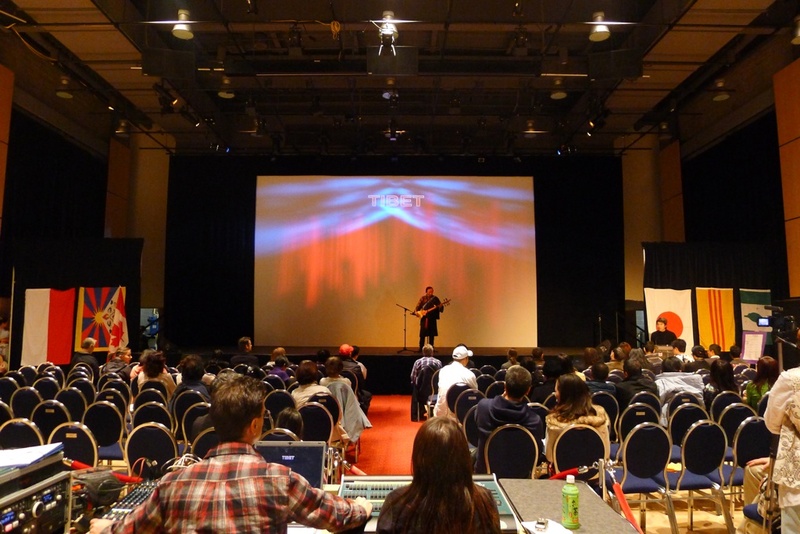 Posted by elzilcho in Musical Performances, Public event, Tibetan Arts and Culture. 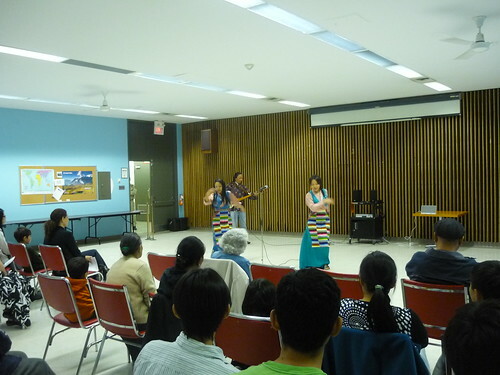 On Saturday, May 15, Drebu organized a special presentation of Tibetan music, dance and youth breakdancing to commemorate the national Asian Heritage Month in May. 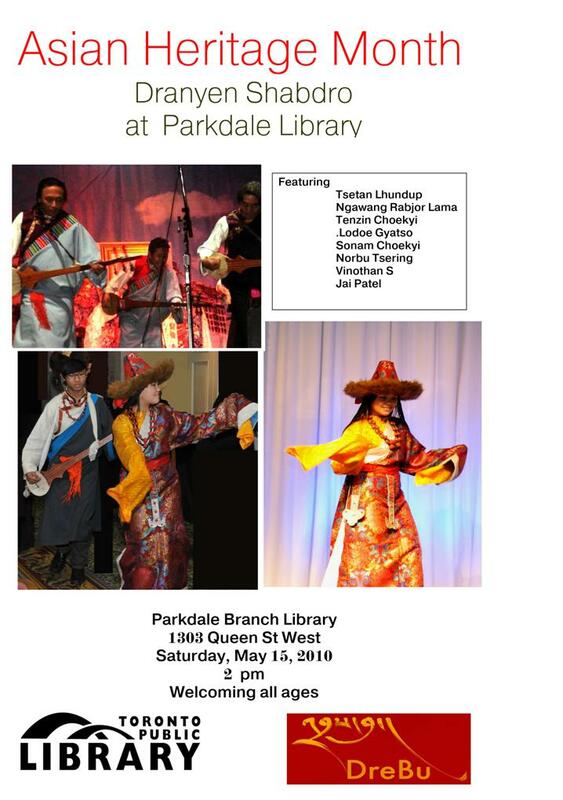 This annual event is sponsored by Toronto Public Library all across the GTA. 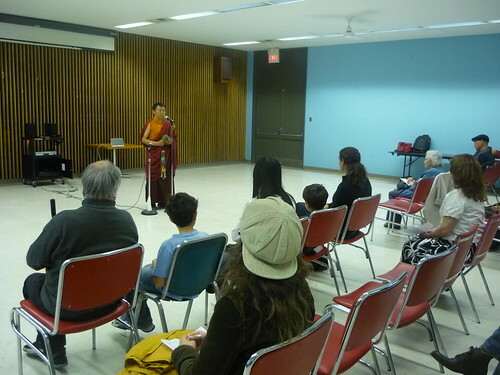 The event in Parkdale was held in Parkdale Public Library since this community is a major Tibetan hub in North America. 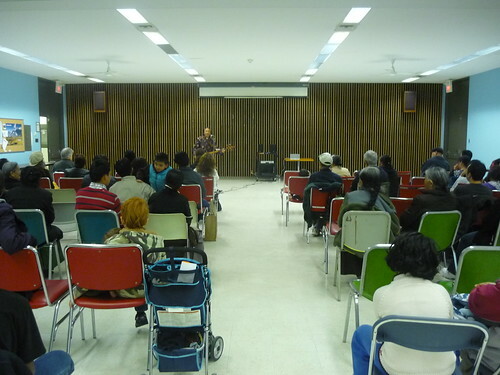 This was also the first free public Tibetan musical performance arranged by the library. The hour-long event started at 2 pm, and was attended by nearly 80 people. Kushog (Tibetan for monk) Ngawang la recited a prayer called “Mani Monlam”, using the Buddhist ritual instruments Drilbu and Damaru (a bell and a hand-held miniature drum-like instrument). The Drilbu and Damaru’s sound represent the speech/teachings aspect of an enlightened mind to help dispel bad energy while bringing in positive vibes and peace of mind. The prayer was dedicated to universal harmony and to those who suffered in the tragic earthquakes in Haiti and Tibet. 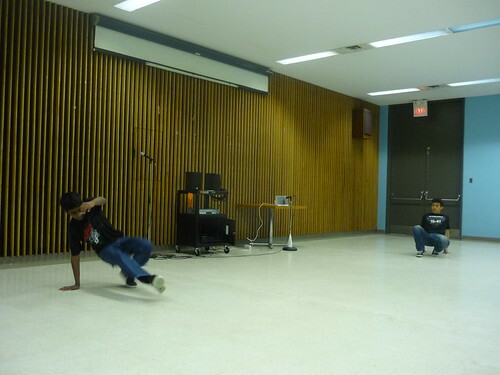 Two Parkdale youth, Vinoth and Norbu, performed a break dance routine to Asian beats. Tsetan la, a master traditional Tibetan musician who graduated from the Tibetan Performing Arts Centre in Dharamsala, India, performed three songs on his “Dramnye”, a traditional Tibetan string instrument. This style of performance is also called, “Dramnye Shabdro” meaning “dancing to the sweet and melodious sound”. 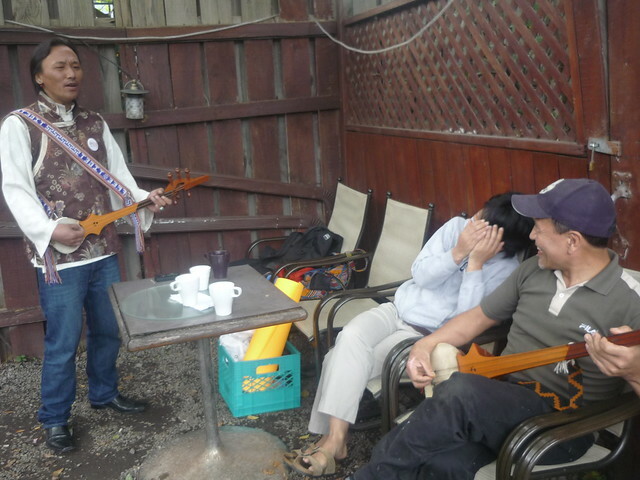 The first song was titled, “Kalpa Sang So”: a song calling us to remember our past generations and their contributions. He also performed a traditional Western Tibetan song, “BangZoe”: a song about identifying the real treasures in our lives. The last song was, “Dolma Lhakhang” in dedication to the female Buddha and Protectress. Two young female performing artists, Tenzin Choekyi and Sonam Choekyi, presented two dances. One demonstrating the lives of farmers working in the fields and another on appreciating nature. 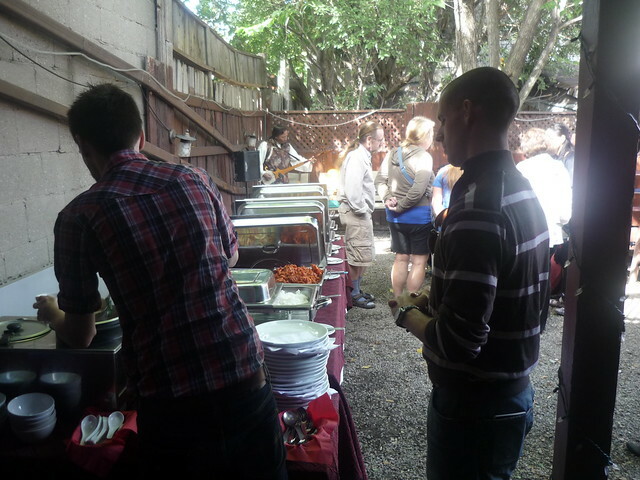 The event concluded with light snacks and refreshments. All performers received a modest honorarium offered by Toronto Public Library in appreciation for sharing our culture and taking part in keeping the diverse Canadian culture dynamic and thriving. Thank you to Miranda Huska, Parkdale Library Branch Head in initiating this program. 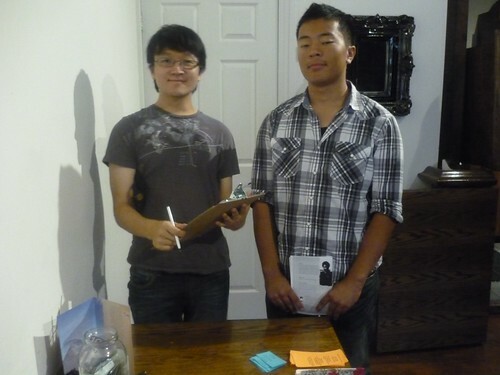 Thank you to Dolkar and Kalsang in volunteering as the gracious ushers for the event. Thank you to Kalden for being the DJ of breakdancing. 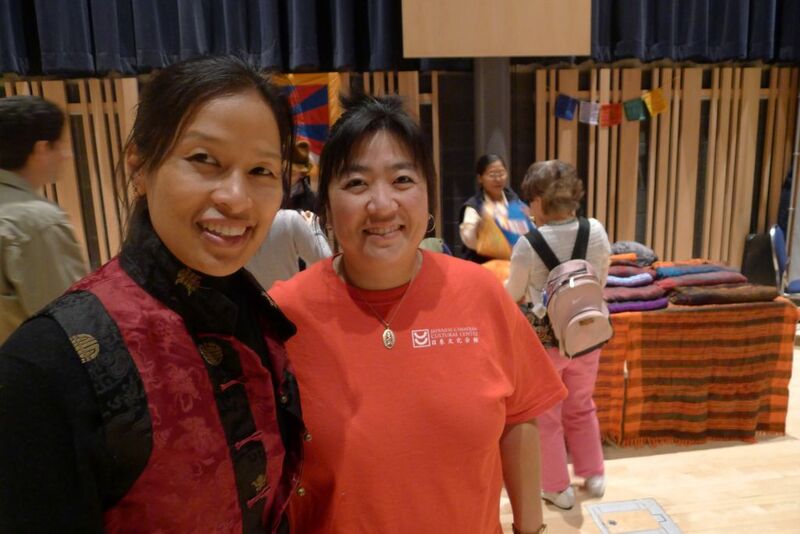 Drebu would also like to thank all the performers and the attendants who came out in support of the event to celebrate Tibetan Culture and Asian Heritage as part of Canada! Copyright DreBu 2010 – 2011. All rights reserved. 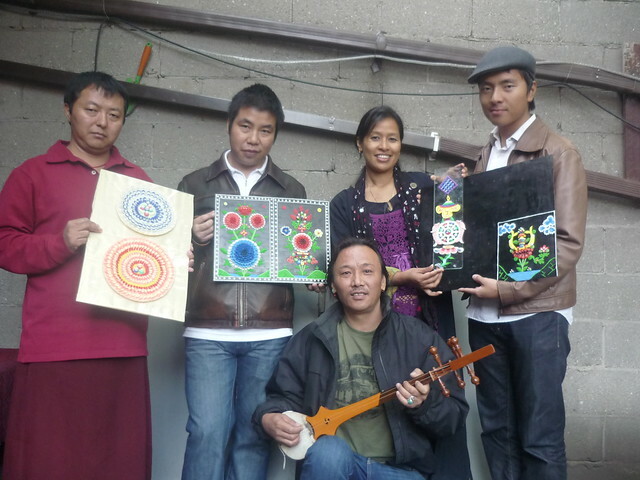 Posted by KDA in Musical Performances, Public event, Tibetan Arts and Culture. We’re excited to announce that Drebu will be participating at the Road to Asia Festival 2009. On Saturday, Nov. 7, we will feature Tibetan dances and songs by Tibetan youth artists who will be playing dranyen and flute. On Sunday, we will be presenting a ritual by Tibetan monks using traditional monastic instruments. 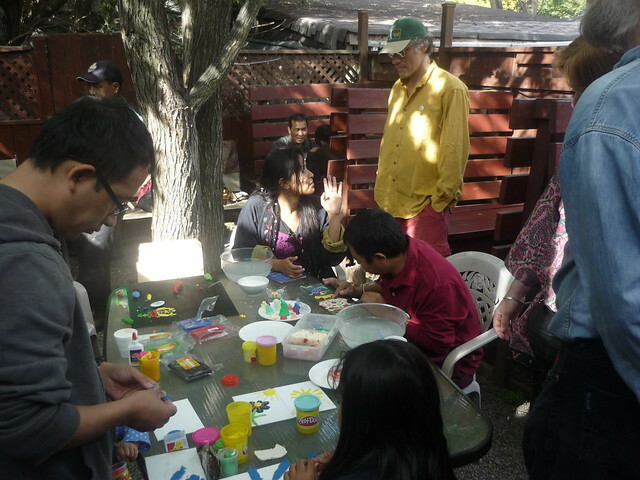 We will also be coordinating Tibetan artists who will be engaging the public, especially children, to paint Tibetan motifs and designs throughout the festival weekend. 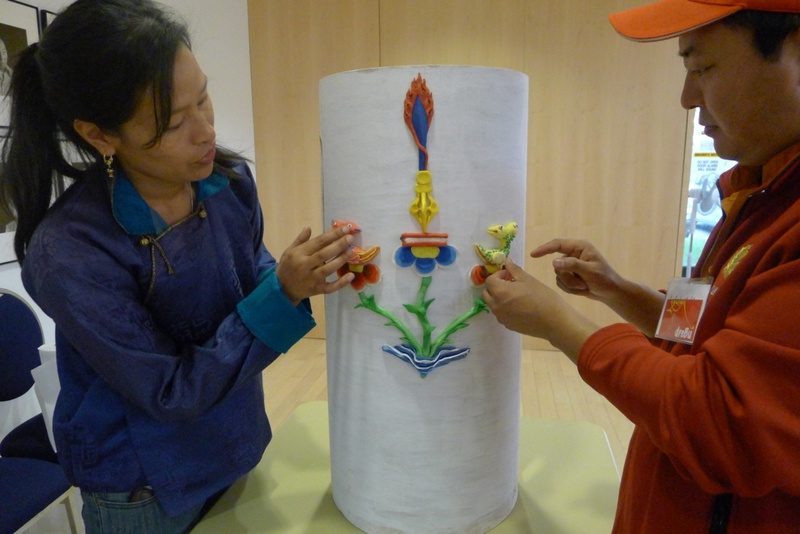 The artists will also demonstrate Tibetan sculptural art with colorful clay. JCCC is organizing a painting contest for children up to 12 years old. 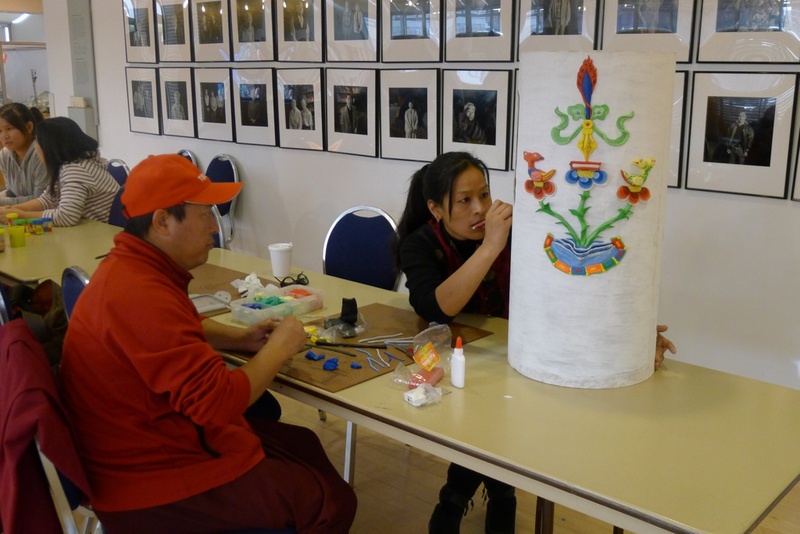 Drebu is happy to coordinate the contest for Parkdale area and Tibetan community. Download the copy with instructions below: click on the link; you can print it and let your child colour it. Please drop off the completed coloring sheet with your child’s name and your email address at Tibet Kitchen (attn: Drebu) by Thursday, Nov. 5th, 6 pm. Winners will be announced by November 13th, Friday via email. You can also pick up free passes to the festival at Tibet Kitchen. First come first serve. The price otherwise is $5 for each day at the centre. Please spread the word. So come join us. Enjoy the diversity of our Asian cultures, partake in the activities, have some delicious food, and be proud of the fact that Tibet and Tibetan culture is front and centre in community events such as this. The road to Asia Festival 2009 is a two-day festival celebrating the richness and exciting diversity of Asian culture. The festival creates a thriving multicultural atmosphere which highlights Asian cultures through traditional Food, Arts and Crafts, Music, Dance and Martial Arts. All under one roof. 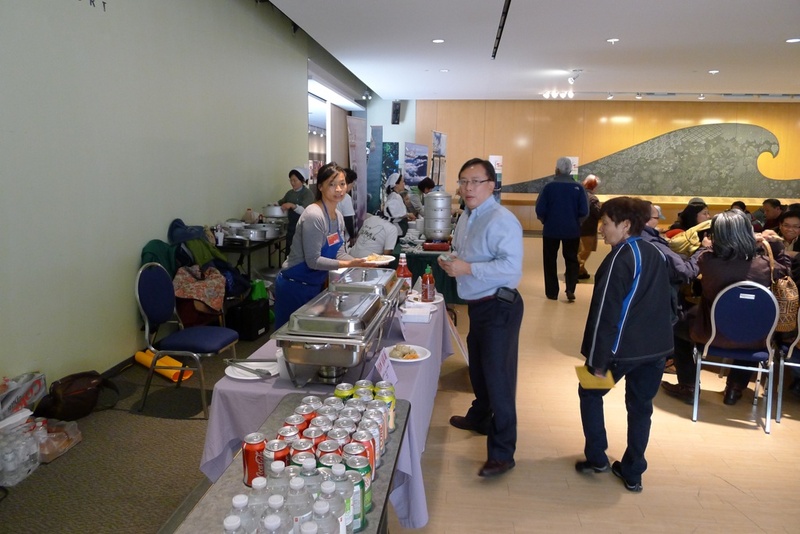 The festival is organized by the Japanese Canadian Cultural Centre.